Innovation, beauty and quality in ceramic covering. The Lef Group was founded in February 1994 in the city of Piracicaba, in the state of São Paulo, with the mission of responsibly transform natural resources into products for coating environments with innovation, beauty and quality. The products of Lef Cerâmica, ViaÁpia, ViaRosa Porcelanato and Rox brands are produced in their modern Industrial Park. Today, as a result of the focused and enterprising vision of its owners and the excellent work of the entire team, the Lef Group is among the leaders of its segment in Brazil. The Lef Group, within its policy of growth and quality, always presents sophisticated products of typology, quality and innovative design to the market. For these qualities and differentials we are a unique company in the ceramic segment. Qualified representatives, distributed by region, are responsible for customer service throughout the country. The foreign market is serviced by our foreign trade team and various agents all over the world. Our production processes go through the most diverse and modern quality controls, from the extraction or choice of raw materials to the classification and palletization of the finished products, always guaranteeing an excellent quality. Postures such as these, make the Lef Group a dynamic and innovative company, always exceeding the expectations of its customers, thus making the opening of new markets only a consequence of its work. The entire covered area of ​​the company (150.000 m2) is used to collect rainwater. Our storage capacity is 13 million liters of water. All the water used during the process, after being treated in a treatment plant, is ready to be reused in the production process. The average consumption is 5.6 million liters. At Lef Cerâmica, productive investments are thought together with sustainability practices. The processes follow rigid controls to optimize results and neutralize the impacts to the environment. After a controlled extraction by the responsible organs, the areas of clay extraction are reforested with the management of the existing species in the place. All production lines are equipped with filters to control the emission of gases, ensuring clean and pure air to the atmosphere. The hot air that would be released to atmosphere, is reused in the process generating a lower consumption of natural gas. All solid waste generated throughout the production process is reused. 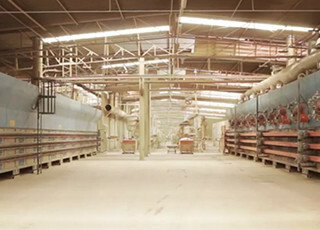 LEF Group Industrial Park has the most modern national, Italian and Spanish equipment for the production of ceramics. Technology investments are constant and make our company unique and pioneer in the market. In addition to the constant equipment investments, the investments in training guarantee a very well trained team to maintain the quality of the whole process. First brand of the Group, launched in 1994 with the production of ceramic floors and coverings with dry technology. Today, it is among the market leaders in this segment, it manufactures and sells floors and wall tiles in the 44 × 44, 57 × 57 and 31 × 57 formats. A complete line with several designs and finishes. In 2011, in anticipation of the market, the Lef Group invested in the creation of the ViaÁpia brand. The products stand out for using Full HD digital printing technology in the dry process. The company was the first to master this technique for the production of ceramics in the world. ViaÁpia presents to the market sophisticated products of typology, quality and innovative design, which makes it a reference in floors and ceramic coverings. With a portfolio consisting of floors and wall tiles in the 31 × 57, 44 × 44 and 57 × 57 formats. 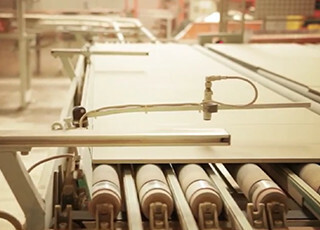 In 2008, the Lef Group began a new phase in the company with the installation of the wet production line for the production of porcelain tile and mono porous tiles thus creating the brand ViaRosa Porcelanato. ViaRosa is currently a national and international reference in the production and marketing of porcelain tile flooring and wall tiles and mono porous tiles. Bringing innovation in the world market, the brand maintains its position among the leaders of this market with a complete portfolio. Portfolio consisting of floors and wall tiles in 31 × 58, 54 × 54, 72 × 72, 45 × 90 and 22 × 90 formats. ROX, the LEF Group’s newest brand, was launched in early 2015 and brings the concept of democratic and balanced design and the mission of offering products that combine quality, current design and cost-effectiveness. With a portfolio consisting of floors, ceramics and porcelain tiles, in 44 × 44, 57 × 57 and 72 × 72 formats and wall tiles, ceramic and mono porous tiles, in 31 x 57 and 31 × 58 formats. Lef Group ©2017 - All rights reserved.